David is president of the Pisces Foundation and its founding staff member. He leads our efforts to support innovators working to ensure a clean and healthy environment. As the Foundation’s first staff member, David worked with the Foundation’s trustees to frame our goals, programs, principles, and operations, opening our offices in San Francisco and Washington, D.C.
David previously directed the national water program at the Natural Resources Defense Council, one of the nation’s largest environmental advocacy organizations. Under his leadership, the water program became one of NRDC’s national strategic priorities and substantially expanded its staff and financial support. Over 17 years at NRDC, David litigated precedent-setting water quality cases in state and federal court, drafted legislation that led to implementation of groundwater monitoring and water quality programs in California, and authored reports on a range of environmental policy issues. 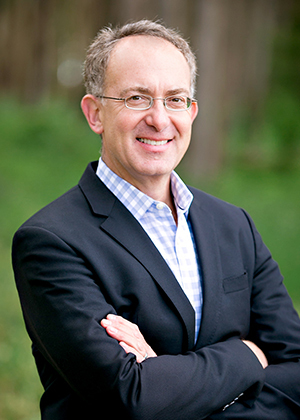 David currently serves as chair of the board of the Water Foundation. He has received numerous awards for his work, including an “Attorney of the Year” commendation for environmental law from California Lawyer Magazine. For five years, David served as a distinguished visiting scholar at California State University, teaching environmental policy and law. David has contributed op-eds on environmental topics to newspapers including the Los Angeles Times and the New York Times and throughout his career has been quoted in national print and television media on environmental topics. David is a graduate of the University of California, Berkeley, and Harvard Law School.